Do you have any pre-war Tootsietoy catalogues, particularly for the years 1934 to 1941, which could be scanned and included on this website? Please e-mail me if you can help. Special thanks to Lloyd Ralston Gallery Auctions who have freely allowed me to use their photographs of Tootsietoys from recent sales, including the Gates Willard and Irving Davis collections. This article originally appeared in nine parts in Model Cars magazine (in England) from January to September 1971 (it was subsequently reprinted in Antique Toy World in the USA in 1972). It remains, in my opinion, the most authoritative and scholarly history of pre-war Tootsietoys, and surpasses the later books which have appeared on the subject. 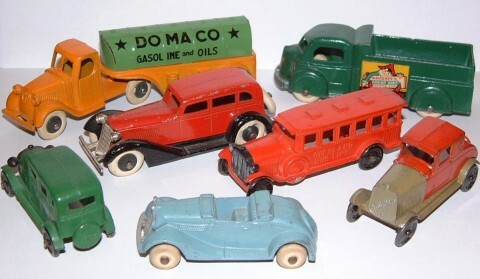 The original magazines are now very hard to find, and many collectors are unaware of this important work on the leading American brand of miniature toy cars. I am happy to be able to bring the article to a new generation of collectors through the internet. I have made a few editorial additions which are shown in blue. The author, Dr.Clinton B.Seeley, wrote under the pseudonym C.B.C.Lee (see his biography). Clint Seeley died in March 1984, and the article is reproduced with the permission of his widow Gail Seeley. Thanks to her I have also been able to include many of Clint's original photographs and source material such as catalogue pages. Where possible I have replaced the old photos with digital colour photos of models in several collections or taken from internet auctions. In the case of auction photos, I have no record of the photographers, so if you see your photo here please take this as an acknowledgement and thanks. If you would like to contribute photographs of items or variations which are not shown, please e-mail me. The article is divided into parts as originally published. Philippe de Lespinay's website with Tootsietoy photos and details of many colour variations. Bill's Vintage Toy Garage - another collector's personal site.